He said he had cancelled some 16 agreements signed with foreign companies in the field of gem and mining industry. 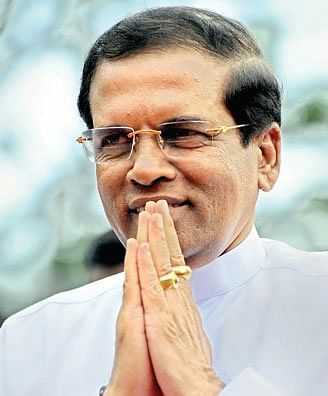 COLOMBO: Sri Lankan President Maithripala Sirisena has said that he deliberately avoided having Comprehensive Economic Partnership Agreement (CEPA) with India on the agenda during his recent visit to New Delhi. "I want to assure you that I will not enter any agreement with any country that will be harmful to our businesses," he said while addressing local businesses during the weekend. India and Sri Lanka have been grappling with sealing the CEPA for several years. Sri Lankan services sector expressed apprehensions over the advantage it handed the Indian counterparts. Sirisena made his first official visit to India last month. During their talks, Sirisena and Prime Minister Narendra Modi agreed that there was vast potential for expanding economic cooperation by implementing provisions of the Free Trade Agreement signed between the two countries in 2003. The trade between India and Sri Lanka is more than USD five billion. Prime Minister Modi is scheduled to make a return visit to Colombo in the middle of this month.